Xavier Iñiguez was born in October 7, 1932 in Vista Hermosa, Michoacan. He died in 1979 in Mexico City. In 1942 he studied architecture in Mexico city. In 1951 he was awarded a scholarship to study art at the Academy of Art. In 1952 another scholarship was awarded to him to study at the National stamp Press Shop by the Treasury Department. 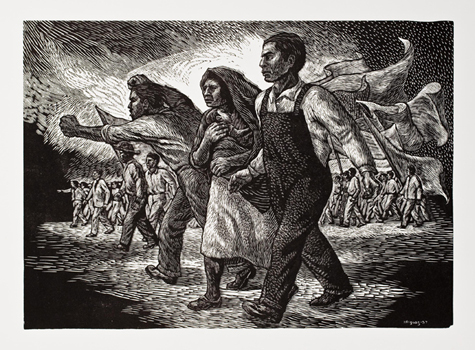 In 1954 he assisted in a mural at the central electric producing company in Temescal, Oaxaca. He was member of TGP from 1956 to 1959. During this period he produced a mural in a school in the State of San LuIs, Potosi the state where he was the head director of INBA (NATIONAL INSTITUE Of FINE ARTS). From 1960 he taught as a professor at the Esmeralda Art school, and at the San carlos Academy of Art, the School of Art at the Universidad Autonoma de Mexico.